Heavy rain and wind can cause pepper anthracnose to flare up quickly! 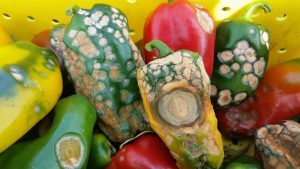 Growers with peppers in fields with a history of pepper anthracnose should scout on a daily basis and initiate a fungicide program as soon as small fruit begin to develop. Pepper anthracnose can be very difficult to control once established. All bell and non-bell peppers are susceptible. Strip picking and removing all fruit from ‘hot spots’ when they first appear may help suppress spread of the pathogen. Preventative fungicide applications should begin at flowering or fruit set. Use a heavy volume of water and make sure coverage is extremely good. Apply high rates of chlorothalonil or Manzate weekly and tank mix and/or rotate weekly with one of the following FRAC group 11 fungicides: Priaxor (fluxapyroxad + pyraclostrobin, 11), Quadris (azoxystrobin, 11), or Cabrio (pyracolostrobin, 11). Please see the 2015 New Jersey Commercial Vegetable Production Recommendations Guide for more information. 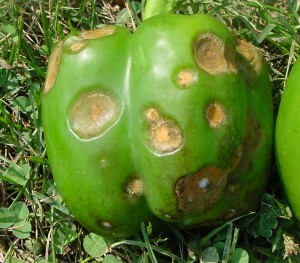 Mature bell pepper fruit infected by pepper anthracnose. Anthracnose on Mature Bell Pepper Fruit: Each spot is the result of a single spore landing on the fruit causing an infection. The pinkish-orange masses developing in the centers of lesions are millions upon millions of spores that will be splashed via rain and wind resulting in new infections. The first cases of pepper anthracnose are being reported. Pepper anthracnose can be extremely destructive causing 100% loss if left uncontrolled. No peppers are resistant to anthracnose. Growers with a history of pepper anthracnose on their farm or in particular fields should be highly diligent and scout their fields on a regular basis looking for ‘hot spots’.